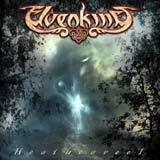 Elvenking, a band formed by young Italians, are bringing out their first album with Heathenreel. This album was recorded and engineered by Luigi Stefanini in Italy and mixed by Fredrik Nordström in Sweden. Let's say that Elvenking sounds a bit like what the actual True Metal scenes in Italy and in Sweden have to offer.The cover is the work from Travis Smith and the logo work is from Jean-Pascal Fournier. So a lot of people for the new comers from AFM Records. Not only for what's around the cd but also inside: they are many additional musicians and classical instruments involved in this work. The style of Elvenking goes from melodic or epic to speed metal with a touch of folk. It goes in the waves of Blind Guardian or Skyclad. The vocal parts are not only assured by Damnagoras the singer of the band but also by different female vocalists, or death parts. The songwriting and production are good, it makes this album very various and interesting. Let's say it is a very good debut album with lots of good ideas. The way is hard and long plus the fact that there are many great bands especially in Italy. So I wish these guys a good luck. Forza ragazzi.